Hong Kong, July 22, 2015 – According to CBRE’s recently published report, The Expanding Role of Chinese Capital in Global Real Estate Markets, over the past four years, annual China-sourced outbound flows to commercial real estate experienced a compound annual growth rate (CAGR) of approximately 72% to reach over US$10 billion for the year 2014. This is the first time annual flows have exceeded the US$10 billion1 mark. 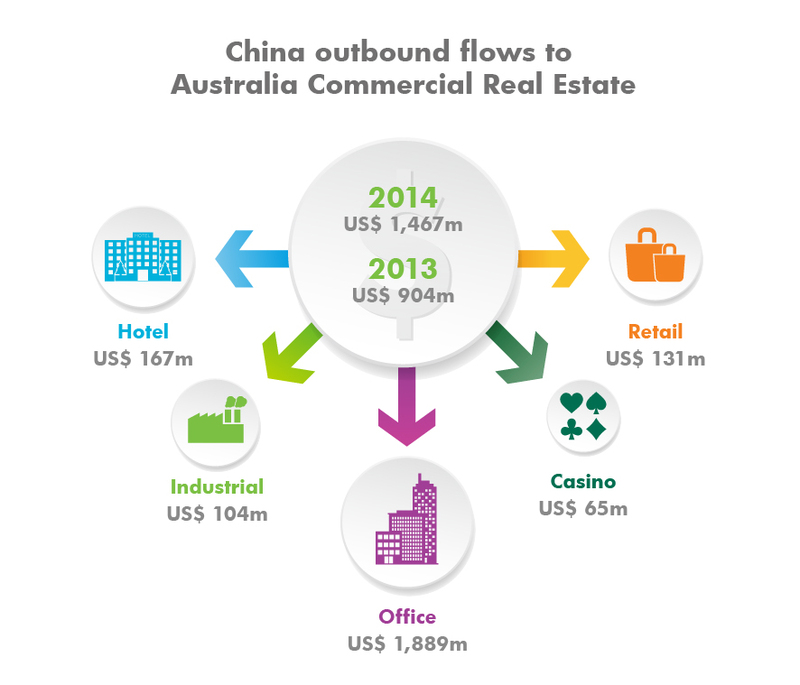 China also accounted for over a quarter of total outbound commercial real estate investment from Asia during 2013 and 2014. The report provides an overview of outbound activity among Chinese individual, corporate and institutional investors, and discusses the opportunities and challenges for Chinese investors both in and beyond gateway cities in the U.K., U.S. and Australian real estate markets. What began with moves by China’s SWFs and tier-one insurers to make highly publicized purchases of trophy assets abroad has now spread to acquisitions by mid-tier insurers and corporate investors. Chinese developers have also been active in expansion into overseas markets to meet increasing demand from mainland HNWIs for residential assets in key destinations. Frank Chen, Executive Director and Head of CBRE Research, CBRE China commented, “the past two years have seen explosive growth in purchases of offshore real estate by Chinese investors, including HNWIs, corporations and institutional investors. Each group is motivated differently. For mainland HNWIs, the purchase of offshore residential property often ties in with the desire to support the overseas study of their children and to prepare for intended immigration. For Chinese developers, the main drive to purchase offshore property is not simply to establish office premises to expand global business lines, as it is for many Chinese corporations, but to meet increasing demand from mainland HNWIs for access to residential properties. For mainland institutional investors, the main motivation is to obtain access to a wider array of attractive investment opportunities and diversify a growing pool of domestic wealth. CBRE’s Global Investor Intentions Survey 2015 revealed London as the preferred city for investment among global investors seeking to purchase commercial real estate assets. With a large and liquid real estate market, as well as a transparent, relatively stable and highly developed market environment, London has drawn wide-spread enthusiasm from global investors. Real estate acquisitions in London accounted for approximately 80% and 52% of total China-sourced commercial real estate investment flows to Europe in 2013 and 2014, respectively. Even as yields in gateway cities across the globe continue to compress, yields are likely to remain comparatively attractive in London; national employment figures for the UK are at a multi-decade high and forecasts of stable economic growth are expected to support the strong performance of local property markets over the next few years. 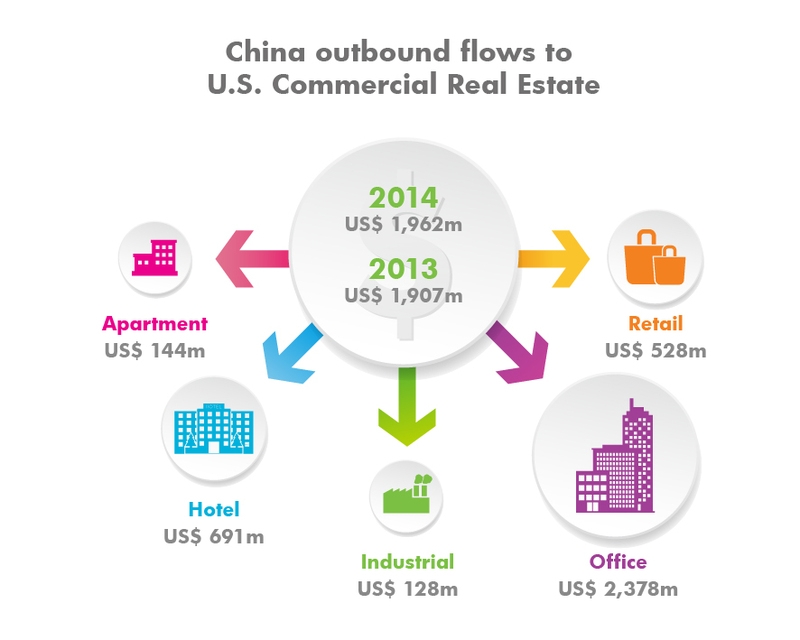 US-bound flows accounted for over a fifth of total outbound investment from China in 2013 and 2014, the majority of which has gone to hotel and office assets in gateway cities. Over the two-year period, purchases of hotel and office assets in New York, Los Angeles, Chicago, Houston and San Francisco accounted for over 60% of US-bound investment flows to commercial real estate, with flows to premium office and hotel assets in New York and Los Angeles comprising approximately half of the total. Whereas the high level of Chinese investment flows to the US and the UK is due in significant part to the size of each nation’s economy and the international status of their financial centers, Australia has instead relied largely on the strength of its commercial ties with China, its largest trading partner. In 2014, China rose to become the second largest foreign purchaser of commercial property in Australia (behind only Singapore). Properties in Sydney drew the most attention from Chinese investors. Initial purchase activity from mainland investors has largely focused on residential, premium office and hotel assets in gateway cities. As they gain experience and become more confident in overseas real estate investment, CBRE expects more investors will start to look for investment opportunities across a wider range of geographies as well as across a greater variety of asset types. As the pressure on property prices in gateway cities in the US continues to increase, in the search for better investment opportunities, mainland investors will need to expand their search to include other large metropolitan areas, such as Atlanta, Boston, Dallas, Denver and Seattle. In the meantime, a number of mainland developers have already begun to foray into retail and other property types. Some institutional investors are also beginning to take note of the attractive returns offered by industrial and logistics properties. Many Chinese investors have little experience investing in offshore real estate; navigating unfamiliar market and regulatory landscapes may prove to be the most significant challenges. In addition to the above-mentioned challenges, the path ahead for mainland investors may also consist of a number of other risks. Regulators in offshore markets may roll out new regulatory restrictions and requirements for foreign purchasers of real estate, as well as implement new policy complicating the landscape for all market participants. The strong performance of global real estate markets in recent years will be followed, invariably, by market downturns that will vary in degree across regions and property types. Mainland investors will thus need to come prepared for these and other challenges as they continue to build their global portfolios.